Minnesota is often called the "Land of 10,000 Lakes," as the state does indeed have an abundance of lakes dotted across its 85,000 plus square miles of land. Most of state's population, roughly 60%, lives in the Minneapolis-Saint Paul area, and this region is where most of the Minnesota commercial real estate listings are situated. The state's economy is powered by a robust agricultural sector, mining and logging. Minnesota is a geographically large state with an abundance of fertile farmland, forest and significant mineral deposits. Together these three industries account for a good deal of the gross state product. Commercial real estate listings as well as investment property opportunities can be found throughout the state. The natural beauty of the state coupled with the fact that Minnesota is home to some of the largest companies in America, such as Target, General Mills, Best Buy and many others, helps make Minnesota an excellent candidate for those interested in anything from commercial property to industrial space. 2 bedroom, 2 bath home plus duplex on one large lot. 2- 2 BR apts. Spring fed creek in back. A tri-plex with 30 1/2 X 40 1/2 shop/warehouse on more then 1/2 acre. Zoned commercial. RARE RIVER VIEW PROPERTY AVAILABLE! Commercial L-shaped . Three possibilities for a buyer: 1. Very well cared for owner occupied duplex. Ready to start or expand your business? EXCELLENT GAS STATION/CONVENIENCE STORE LOCATION! Location, Location, Location! .40 acre commercial lot with Highway 210 exposure. Great office park setting. These units do not come for sale very often. 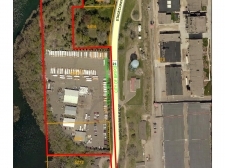 Located one block East of Lyndale Ave S, and one block North of 98th St.
Amazing opportunities with plenty of exposure for a business on Highway #169! Large manufacturing facility in Waseca, Minn. Includes office space, two tanks and loading dock bay.